If you still need evidence of how harmful kinderprison ("public" [sic] school) is, the recent anti-liberty activism by "students" should convince you. If you need more evidence, look at the percentage of former inmates who are die-hard statists. 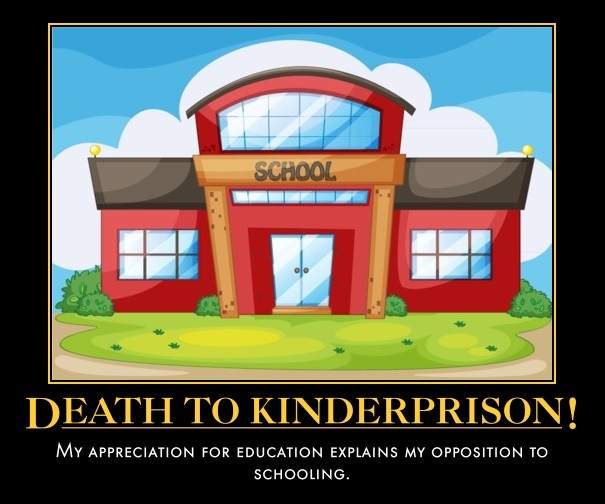 Kinderprison kills minds. Of course, this is what government needs. The lack of skepticism about kinderprison shows how damaging it is. Belief in the legitimacy of governing others is more clear evidence. You don't need anything else, but you still have the overwhelming ignorance (about every critical subject) and lack of literacy as icing on the cake. 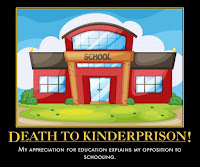 Kinderprison prevents education and it needs to die. It is hundreds of years past due. Civilization can't afford to allow it to continue.